Most dash cams have a typical 1/4 inch – 20 threaded hole at the bottom. That’s a common pattern for tripods and there is a wide variety of camera mounts available for your car. It’s worth noting that most action cameras make great dash cams. That’s includes the very popular GoPro line. The majority of action cameras also have that common screw hole pattern at the bottom. If you have a GoPro, remove the weatherproof case from the camera and you will see that hole at the bottom. The exception to the rule of the tripod hole is the Garmin line of cameras. Garmin uses a similar mount to their GPS line and you can read a detailed article on those mounts here. After ensuring your camera has the standard screw hole on the bottom, think about where you would like to place the camera. The most common location is the dashboard, next comes the windshield. We have seen a few cases where a headrest mount is used and we covered that type of mount in our headrest mount article which you can read here. When selecting a mount be sure it will be stable when in use in a car. I have found most gooseneck mounts to be poor choices because of the effects of car vibration. If you stick with a plastic or metal mount, that will generally suffice as these are not as prone to the effects of a vibrating and shaking car. If your camera has a good image stabilization feature, the effects of vibration from the mount may not be as important. Good dash mounts come in two styles. The first, and most widely used, is a dashboard mount that uses an adhesive bottom. Be sure the adhesive is a very high bond (VHB). Prior to attaching your VHB adhesive mount, wipe the dash absolutely clean, apply the adhesive mount and let it sit for at least 24 hours. Try to avoid applying in very cold weather. Consider the Arkon Car Dashboard Camera Mount. It’s one that I have used personally. I like this because it is low in profile, uses VHB adhesive on the bottom and is very steady. The second type of dash mount involves the use of a bean bag with a non skid base. 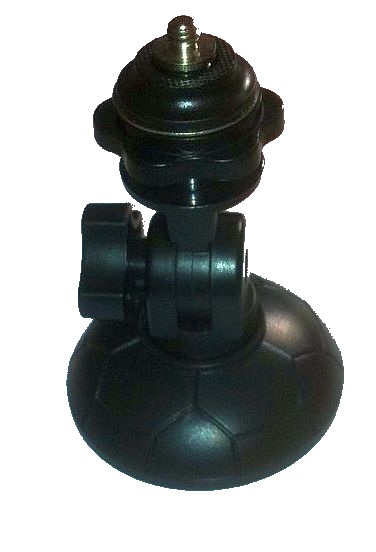 The Arkon Camera Car Dashboard Mount features a very good bean bag base which we have previously reviewed. The benefits of the mount include easy portability because there isn’t any adhesive involves. Simply remove the entire mount. We suggest using their unique safety anchor which ensures your mount stays on the dash. The next type of mount that we see in use for dash cams is on the windshield. The trick with a windshield mount is to find one that will bend upwards so that your camera screw hole located on the bottom of your device can be used and your video stays upright. Naturally, if your camera has the ability to turn your video 180 degrees, this is not an issue (most good cameras have this feature). Most windshield mounts use a suction cup on the bottom and there are plenty of inexpensive mounts that are of the suction cup variety. Be careful to sect a high quality mount that is not going to vibrate. We recommend the RAM Suction Cup Camera Mount for the windshield. Yes, it cost more than the plastic varieties mentioned above, however the advantages make it a worthwhile purchase. The mounts come with a lifetime warranty and have a solid metal arm with a vibration absorbing design. Your video will be extremely stable with this mount. Adhere the suction cup portion of the mount to this base to turn it into a dashboard mount.